Avocados are California. They are our heritage fruit. My great great grandfather grew a huge seedling avocado tree at his house near Los Angeles. 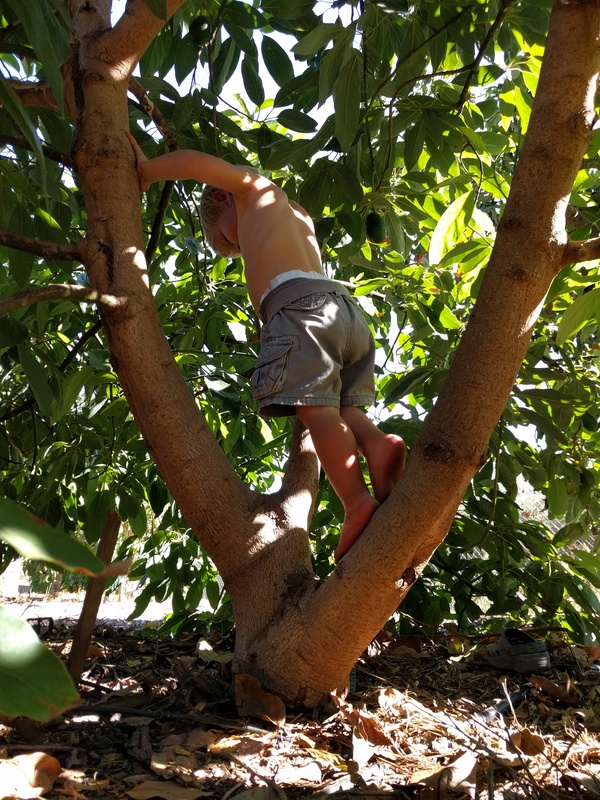 When my mother was a child, she climbed in her neighbor’s Fuerte avocado tree. I have planted avocado trees over the placentas of each of my children. This is a post about how I grow avocado trees in my yard and how you might want to. Or not. Avocado trees can survive and produce fruit without some of the exact conditions or care that I describe below. I’ve seen pretty happy looking trees with grass or concrete under them instead of the wood-chip mulch that I place under mine, for example. But I’ve seen many more happy looking avocado trees that get treated the way I treat my trees. Almost every yard in Southern California between the mountains and the ocean can grow an avocado tree. Think Sunset zones 18 through 24 (find your Sunset zone here). 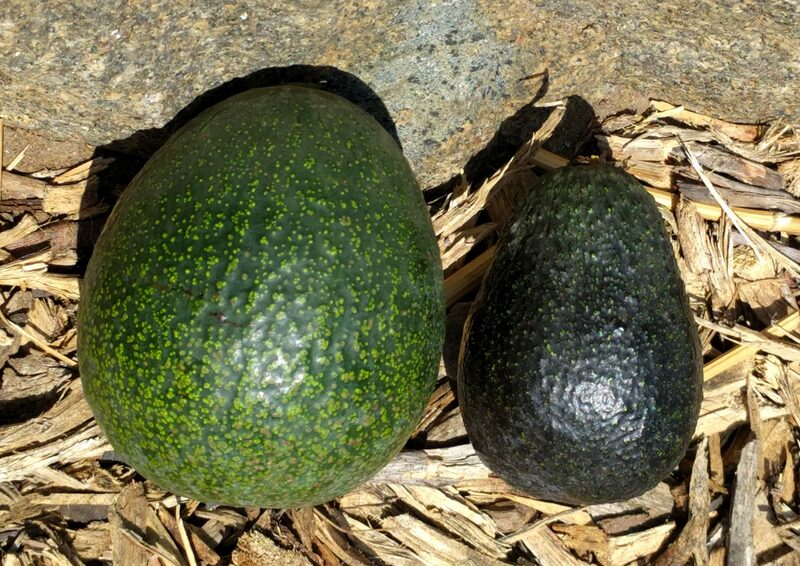 You only have to decide which micro-climate in your yard is best for an avocado. Micro-climates with these characteristics are ideal: wind-sheltered, as sunny as possible, warm in winter. I currently grow thirteen varieties. Someday, if my wife allows, it might get up to twenty. There are just so many worthwhile avocado varieties to grow. Yet, almost every avocado found in grocery stores is a variety called Hass. Hass (rhymes with “pass”) originated in Southern California and can be grown in almost every part of this region. And if you have desire and yard space for just one avocado tree, you’ll likely be most satisfied with a Hass tree. Hass tastes great (better from your yard than the store, by the way), is very productive, and the fruit hangs on the tree ready to be picked longer than most other varieties, for at least six months (approximately January to July). If you have desire and room for two avocado trees, I’d recommend Reed to go with your Hass. Reed also tastes great, is usually even more productive than Hass, and while the fruit doesn’t hang on the tree for quite as long as Hass, it is ready at a different time (approximately May to September). You know what a Hass avocado looks like, but here is a Reed on the left. On the right is another nice avocado variety for Southern California that is very fruitful and also ripens in the summer; it is called Lamb. Avocados can be grown in sandy or clayey soil. If your soil is sandy, you’ll have to water more frequently. If your soil is clayey, you’ll have to water less frequently. It’s not that you can water less frequently with clayey soil, you must. Avocado roots have a great need for air and can’t be in saturated soil for long without suffocating, so a spot in your yard that often puddles and doesn’t drain away within a few hours after a rain in winter is not appropriate for an avocado tree. This is my Reed avocado tree. At about 12 feet wide and tall, it has around 75 avocados on it for next summer. You can successfully plant avocado trees at any time of year in Southern California, not just the spring, as some people recommend. In fact, I find it easiest to plant in the late summer or fall. The weather quickly becomes mild and rainy, when you no longer have to pay the young tree so much attention as it gets settled in. That being said, it will be necessary to keep an eye out for any extremely cold weather and protect that baby tree if necessary. Plant an avocado tree at the same level as the surrounding soil if your soil is sandy. If it is clayey, the tree would appreciate being up on a slight mound — anywhere from a few inches to a foot up is good, with a mound width of 3-5 feet. Do not plant an avocado tree in a basin, below the level of the surrounding soil, ever. That will cause water to pool around the base of the trunk, which is not where the tree wants to grow its roots, and which can lead to rotting diseases on the trunk. Dig a hole that is just a few inches wider than the container the tree is in. Be very gentle when you remove the rootball from the container as avocado roots are brittle. Check the sides and bottom of the root ball for circling roots. If found, gently pull them loose to straighten them out. To splay the roots out you may need to widen the planting hole. Fill in the hole around the root ball with the dirt you removed when you dug it. There’s no need to add anything else to the planting hole, such as compost or fertilizer. Do not place landscape fabric around the base of the tree. Landscape fabric prohibits the tree from growing roots up to the surface of the soil, as it is naturally inclined to do. But do place mulch around the base of the tree, and let whatever leaves fall lie in place. A coarse mulch of wood chips and twigs and leaves (tree trimmings) is ideal for avocado trees. Put down a layer about five inches deep at first, spreading about two feet out from all sides of the trunk. 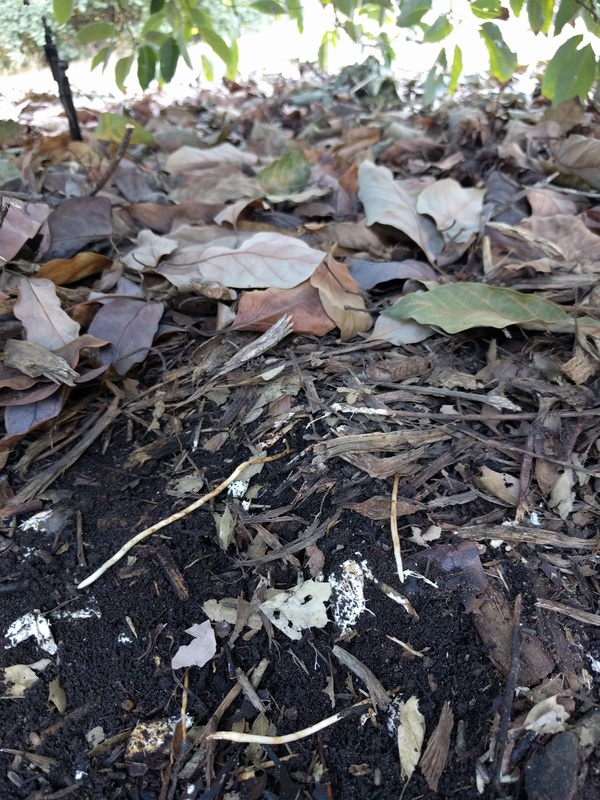 Such a mulch covering the soil is loved by all avocado trees, but for those growing in loam or clay soils it may mean the difference between life and death because it allows the roots to proliferate just under the mulch where there is much air and where there are disease-suppressing enzymes and micro-organisms. Read about a study done by the University of California on the effects of mulch on avocados here. 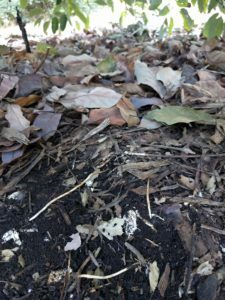 Within two years after planting, if your tree is in tip-top shape, you should be able to scoop the mulch layer away in a spot under the tree and find many white or cream-colored roots sticking into the mulch above the actual soil. Watering is the most important thing to get right for an avocado tree — by far. Get the watering right, and your job is almost done. Immediately upon planting, water as much as necessary such that the soil out to about three feet from the tree’s trunk is wet down to two feet deep. If the soil is dry at planting time, this might even take up to 30 gallons. This is not a time to be stingy or hasty. 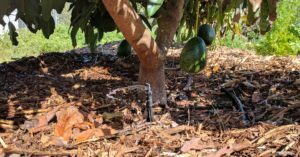 Avocados can be watered with drip emitters but they do better, especially as they get older, with sprinklers. Any kind of sprinkler that waters most of the ground under the tree’s canopy is acceptable. But one of my favorites is this DIG micro-sprinkler that comes with different spray and spin patterns. I use such a micro-sprinkler in its sprayer mode on my newly planted avocado trees. Details about how to water a newly planted avocado tree can be found here, but the main take-away is that you need to water newly planted trees very often, every day or every other day for the first couple weeks in the summer. They’re very sensitive to drying out at first. 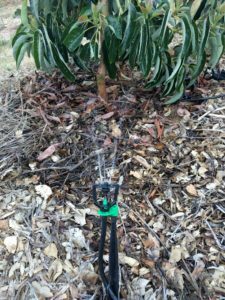 I switch to using the micro-sprinkler in its spinner mode on my avocado trees after their canopies are at least four feet wide in diameter, which is usually the case in the second or third year after planting a tree from a five-gallon container. How much and how often to water? You must regularly scrape the mulch away and observe and feel the soil. Sorry, but there is no substitute for getting your hands dirty. The soil at the surface should never be allowed to become totally dry. At the same time, if the soil at the top is wet (still feels like it does a few hours after watering), then it should not be watered again yet. This goes for new and old trees alike. You’ll find that new trees dry out much faster than old trees, and so new trees must be watered more often than old trees. Give all trees enough water each time such that the soil is wet as deep as the tree has roots. This varies from yard to yard, and even within yards, but for reference I have never found roots under my avocado trees deeper than 2 feet. The only way to know how deep you’re watering — and where your tree’s roots are — is to dig and discover. You won’t significantly hurt the tree by doing this. 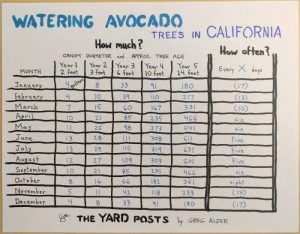 Nevertheless, I’ve made a table showing approximately how much and how often to water avocado trees in California which gives you a schedule to try out and adjust as needed. 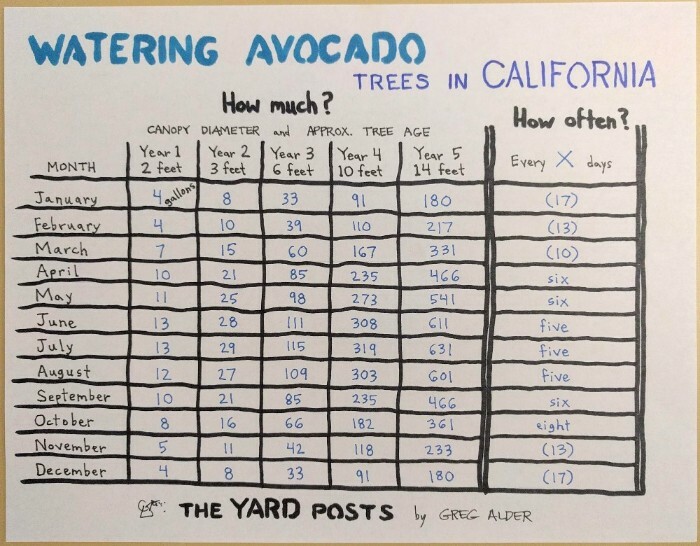 Table showing how much (in gallons per month) and how often (in days) to water avocado trees in California. Keep a layer at least two inches thick of wood chips under the tree at all times. This protects and feeds the worms and microbial creatures in the soil below, which in turn protect and feed the tree’s roots. With this mulch, it’s very possible that you will not need any additional fertilizer. I have friends who apply fertilizers to their avocado trees in place of or in addition to mulch, and some of their trees look great and are very productive. But I’ve never applied fertilizers to any of my trees because they’ve never told me they’ve needed anything more than the deep mulch of wood chips that I provide. Just mulch works for this Hass tree. It’s carrying over 100 avocados. There are only a few good reasons to prune an avocado tree. One is to remove branches that are very low and interfere with sprinklers from distributing water out to near the tree’s canopy edge. Another is to keep a tree balanced so that it doesn’t topple in strong winds. You might want to keep an avocado tree down to a particular size as well. Also, get to know how an avocado tree makes its fruit: it grows flowers in the winter and spring, and then some of those flowers become fruit; some avocado varieties (such as Fuerte) grow their fruit rapidly and the fruit is ready to pick that winter, but others (such as Holiday) mature their fruit slowly and are not ready to be picked until the second summer. I can’t imagine a yard in Southern California without an avocado tree. They’re evergreen and beautiful, the fruit is unparalleled — it’s like being able to grow butter — and let’s not forget that the bark is smooth so the branches are perfect for climbing. I made a video, also titled “Growing avocados in Southern California”, showing a few of my avocado trees, the way I water them, how I stake a newly planted one, and how I mulch them. Figured it might be helpful to see these things in action, so to speak. It’s not an award winner, but I put it up on YouTube anyway. Please let me know if it would be helpful to see anything else on a video like this. Also, be sure to check out the website Avocadosource.com. You could spend a lifetime reading all of the wonderful materials on that site. I need to visit some of these avocado farms in California. what can I do? I would contact the California Avocado Commission or the California Avocado Society. Thank you very much for the information, excellent!!! Have you grown a Sharwil? I have one planted on a mound in my canyon yard near Balboa Park. It is about 2 1/2 feet tall by 2 feet and seems to be healthy. I wanted to know if you have any idea how soon these bear. I have a three year old Holiday nearby that has flowered the last 2 years and had some marble size fruit on it last year but all fell off. I do have a Sharwil. It’s a couple years old but it hasn’t set fruit yet mostly because it’s been repeatedly attacked by gophers, the poor little guy. I have a friend not too far from you in La Mesa with a Sharwil, though, that bears lots of fruit. I’d expect yours, at the size you described, to maybe set one or two fruits this coming spring, but no more than that. More likely, you’ll get your first fruit growing on it in 2019. That being said, I’ve never known Holidays to be very productive. Holidays are runt trees that creep along the ground, which is interesting for an avocado but can be frustrating if you want an actual tree with a lot of fruit. If you end up dissatisfied with the Holiday, can I recommend a Pinkerton? It will also pollenize your Sharwil and is very productive. Greg- what’s your experience with the sharwil? I’ve read in some places it’s kind of a dwarf and in other places that it’s a massive sprawling tree. Any advice? Also, small recommendation, when you respond to our questions I don’t receive an email notification that you’ve done so with a link back to this post. Any chance you can turn that feature on? Thanks for the request about getting an email notification with a link when I reply to a comment. I’ve been trying to get around to setting up such a feature. Your request makes me bump it up on the list of to-do’s. I’ll get that set up this week, hopefully. Please don’t hesitate to offer other suggestions that will make the site easier to use. 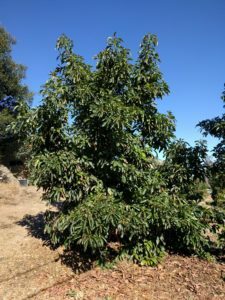 Sharwil avocado trees: I’ve only observed two mature Sharwil avocado trees with my own eyes here in California, one in Orange County and one in San Diego County. Neither is a large tree for an avocado. I’d call them medium. They are not “dwarf” like Holiday, that’s for sure. They are also not big like a Hass or Fuerte or tall like a Bacon. They are just in between. My own personal Sharwil trees are too young to say anything about their mature forms, but I will say that their vigor, their speed of growth, is moderate. Not a weed on fire like my Nimlioh, and not a droopy bush like my Pinkerton. Thank you for sharing your experiences and knowledge. Your writings are enjoyable and easy to read/understand. QUESTION: In March I planted 40 containers/pots with a number of different potato varies. I now wish to re-use that potato grow potting soil by mixing it with my property’s clay soil to transplanted one, maybe more, avocado trees that is/are currently in huge terra cotta pots. Any cautionary thoughts…as in, do potatoes, Yukon, Reds, Purples, fingerlings, etc. excrete anything harmful into their surrounding soil that might affect the avocado roots? PS I currently have two Hass and a Carmen Hass. The Carmen is our winner, in that, it flowers and produces all year long. My nurseryman, Gary of Laguna Hills Nursery, explained that it’s from Mexico and has truly proven to be our favorite. Oh! And all three trees have been hillside planted in large holes filled with a mixture of native clay soil and new Laguna Hills Nursery bagged soil; which I used for the potatoes. And, as the holes were back filled we spread thin layers of Grow Power Organic fertilizer after filling in every six inches of mixed soil height. Thanks so much for the compliments and helpful comments. There’s no evidence of potatoes having any negative effects on avocados in my experience. In addition to sweet potatoes and lots of other plants, I’ve grown Irish potatoes under my avocados for years, and in different yards with different soils. They’ve always coexisted fine. In fact, I’ve got some Irish potatoes and sweet potatoes both growing happily beneath my Hass and Sir-Prize avocado trees right now. Cool to hear your accolades for Carmen Hass. I don’t have that variety, but I’ve always been curious about it. Interesting planting technique for your trees. Sounds like it’s working out just fine. Would love to see pictures of the trees and know how you’re irrigating them. Great information, thank you for sharing. I was particularly glad to see that you have had success planting avocados in the fall because I would like to plant a few trees now – most information online says to wait until early spring. 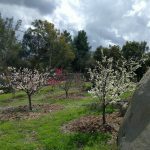 I live in Altadena and while we get the occasional freeze, I am thinking of planting now. What do you think? Also, in terms of varieties, I have a Hass and am thinking about adding a Sir Prize as a B pollinator. Was also going to add a Reed and/or Lamb Hass in increase the month of the year that I have available fruit. Was also considering Gem in a smaller spot. I will likely add a Sir Prize and 1 or 2 others. Would love your input. Fall is my favorite time to plant avocados. In fact, I just bought a couple new trees this last week. The only thing to remember is that if there is a rare freeze this winter, do be prepared to give a little protection to the small trees. B types that have been shown in University of California studies to enhance yields in Hass include Sir-Prize. I have a Sir-Prize next to a Hass in my yard. I think it’s a good choice. I love my Reed and Lamb trees. I’d say go for them. They extend the Hass and Sir-Prize season, which start in late fall and winter. At my house, there’s some overlap of eating Hass and Reed and Lamb in spring, but then it’s just Reed and Lamb for the rest of the summer into fall. If I had to choose Reed or Lamb, I’d choose Reed. I don’t have a GEM, unfortunately. One other thing. I have heard that micro sprayers are the way to go as they saturate all the soil rather than dripping in a few spots. I do wonder about your system which appears to be spraying the trunk of the tree. I have always read that this should be avoided. Your thoughts? That’s a great observation, and a really important question that I should’ve addressed in the post. I may have to edit it in up there. On many of my trees I have a small wood stake that blocks the sprinkler from hitting the trunk, but on my young trees especially, I just let the sprinkler water hit the trunk. I block the sprinkler from hitting the trunks of many of my trees mostly because it’s a waste of water: there are few roots right there under the trunk. But I don’t worry about water hitting the trunks of some of my trees for a couple reasons. One, I water as infrequently as possible, and the moisture at the base of the trunk dries out before I irrigate again — so I figure it’s unlikely that the trees will get crown rot. I also figure this because my soil is sandy and drains rapidly. I’ve heard from experienced commercial growers that if your soil is heavy then you need to be much more careful about preventing water hitting the trunk. So, if I were giving advice, I’d say don’t spray the trunk. But the truth is that in my particular situation I know that I can get away with it. Last thing (I promise), what is the preferred size tree for planting and how much difference will in make in the period I have to wait before getting fruit set? I bought the Hass as a 15 gal three years ago from Garden View Nursery, and I think this year will be the first year I get fruit (fingers crossed). What would the wait be on a 5 gal plant? Don’t hold back, Ian. That’s what I’m here for. I actually have already written a post to answer one of your questions. It’s called “How long until an avocado tree fruits?” Click the link in the “Harvesting” section above. The short answer, however, is three or four years for a five-gallon tree, but often sooner for a fifteen-gallon tree. I personally prefer five-gallon trees over fifteen-gallon trees even though a fifteen-gallon tree will almost certainly bear earlier. My main reasons for preferring five-gallon trees are that they’re far cheaper, easier to plant, and quicker to train into standing on their own without stakes. Having said that, there’s certainly nothing wrong with buying a fifteen-gallon avocado tree. Good luck on getting your first Hass fruit! 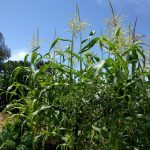 I have a fairly large backyard for Southern California (Mission Viejo) and planted four 15 gallon varieties this past spring- Hass in one corner, and Reed/Sir Prize/Sharwil in the other. My Hass is all by itself but the other 3 are all within 10 or so feet of each other in a triangle. Did I plant these 3 too close together? I plan on keeping them pruned to a max of 15 or so feet (actually that was what I sold my wife on so she would let me plant them in the first place). The reason I ask is because I just picked up a Nimlioh Avocado tree today and could probably fit it in my backyard within 10 or so feet from my Hass but don’t want to make the same mistake. If not I’ll work on convincing the wifey to get rid of some of the front yard and plant another couple trees out front with more room for them to grow. I guess I have the bug to grow avocados, probably because I’m a transplant from Connecticut where you have to spend $20 at the grocery store to make guacamole a couple times a year. Ten feet is definitely not too close. I have a Hass and Sir-Prize that are 7.5 feet apart, and they’re both about 17 feet tall. (I’ll be bringing them back to 15 feet tall in March.) The only challenge might be to get inside the triangle once the trees are big. It might be a hassle to adjust irrigation or pick fruit in there. But that shouldn’t be considered a real problem: avocado branches are flexible and the leaves are soft. I’d go ahead and put the Nimlioh by the Hass. You can definitely keep them pruned to 15 feet, and it always increases production to have that A/B combination. Make sure your drip emitters are wetting the same places that you were previously wetting with the hose. (Or just wet the whole area under the canopies every couple weeks in addition to running the drip lines.) Avocados do most of their root growth when the weather is warm — spring through summer and into fall — so your trees have grown most of their roots over the summer in the places where your hose was applying the water. If you now start giving them water with the drip emitters in a different place, they’ll be unable to access it. The best time to change irrigation methods or wetting patterns is in the middle of winter because the rains saturate all of the surrounding soil, so there is little to no stress on the tree as its roots grow in the spring and proliferate within the new wetting pattern. 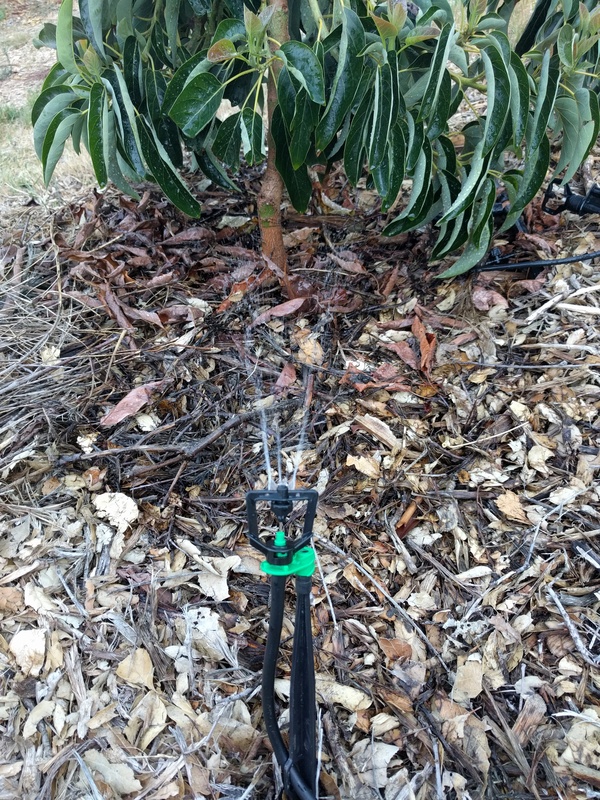 It’s hard for me to say you shouldn’t continue with your drip lines because I know it’s possible to grow avocados on drip, especially young avocado trees. I know this for sure because I’ve done it, as have many others. Moreover, my set up in the past was almost exactly as you described yours. So I’d say you’re safe continuing with your drip set-up, and particularly if your soil is on the loam or clay side rather than the light and sandy side. Having said that, I’d switch over to sprinklers eventually — if not this winter, then next winter. As your trees get older, they’ll almost certainly do better on sprinklers. Mine have. Every other avocado tree in Southern California I’ve seen or heard of has. Thanks for the info and reply Greg, I’ll follow your advice. Can you expand further on your mulch process? I am getting a 5 or 15 gallon Haas tree (haven’t decided yet). Do I lay down a mulch in the planting hole before I put my tree in? Or is the mulch only on top at a 3-5 foot width? I am in Long Beach, CA and our soil is heavy clay. I hope the question is clear. Thank you for any insight. If you have heavy clay, you would do well to test for drainage before planting. Dig a hole about one foot deep and one foot wide, then fill it with water. Time how long it takes for the water to disappear. In my soil, it only takes thirty minutes. That’s on the fast side. If it takes more than around eight hours for yours to drain out, then an avocado might be unhappy there. If that’s the case, then try to mound up the soil a foot or two high and about five feet wide, and plant the tree into that mound. Such a mound, especially when covered with a thick layer of wood-chip mulch, improves the drainage right in that area and helps the avocado roots to breathe as they so desperately need. Good luck with your new tree! Thank you for all the information that you have put out for avocados!!! So helpful. I would like to plant an avocado tree in my backyard in West Los Angeles. I looked EVERYWHERE and can not find a Gwen Avocado. I know that they do exist but can not find it. Four Wind Growers seems to sell it, when available, but it seems to me that they are very young. I am older and can not wait for the tree to fruit in 7 days. Any recommendations? Atkins Nursery in Fallbrook grows Gwen. If you’re in a hurry, you might consider a 15-gallon size instead of 5-gallon. But the good news is that Gwen is precocious in general, so it will fruit faster than many other varieties. Hope you get your Gwen and it fruits fast for you! Greg, I found your blog this week and really enjoy your posts. I just moved into my home in Corona, CA and I am planting a lamb hass today. My soil is pure clay. Seems like when I water there is no drainage. I’m worried about keeping the tree alive in this kind of soil. Any tips? I’m planting on a hill. I read your article about making sure the tree is at or above ground level. I purchased wood chips to put under the tree like you recommend in the article. I wanted to see if you have any further tips for someone who is planting in a crazy amount of clay. My dad said my soil is more clay-like than any he has seen. If you can gather some soil from elsewhere in your yard or elsewhere entirely, just build a mound that is about a foot high. In other words, you’re not going to put your tree INTO your ground; you’re actually putting it on top of your ground, and then mounding soil all around it. In the end, you’ll have a mound of a foot tall and about five feet wide, ideally. And then you’ll cover that with wood-chip mulch. A couple inches is a minimum, but more than six inches is best because you’ll find that they seem to disappear. Six inches today will become two inches by June. I’ve put down twelve inches before and had it vanish into two inches within a year. One more thing: Break up the surface of your ground before you add the mound of soil so that there’s some mixing of the layers of added soil and ground soil. Tree roots don’t seem to like abrupt changes in soil texture. Finally, you’re going to have to water carefully. If you water too often, the bottom roots will rot in the soggy conditions down low. At the same time, if you don’t water often enough during the first couple of months, then the roots in the potting soil will dry out and the tree will suffer. It’s a tight rope you’ll have to walk during this first year, but after that it will become much easier. The secret is to get your hands dirty and feel the moisture in the soil where you find the tree’s roots, and do that test often. That test is fail proof. You can do it! Lamb Hass are tasty, and you’ll have loads of avocados from that tree every summer and fall. Thanks so much for your quick response. I followed your directions and will hope for the best. Love the blog! Keep it up. Hey Greg, I planted my new tree over the weekend aaaaaaaaand there’s a frost warning in Corona until Wednesday. Should I cover the tree? Do you think it will be ok? It can’t hurt to put something over the new tree. I usually use a beach umbrella. But I wouldn’t worry unless your yard is in a cold, low frost pocket. This doesn’t seem like a cold spell that is cold enough to do damage. Frost is predicted at my house too. Still, fingers crossed! I have planted three young avocado trees and have been agonizing about – among other things – the fact that the tips of the leaves were brown. Your post was a HUGE help and the information learned has put my fears at ease. Thank you! I keep reading that avocado trees need to be kept out of the wind. I live in Banning, Ca and it gets. Dry windy here. I do not have an area to plant one that will keep it protected. Am I wasting my time planting one? Will it not survive or produce in a high wind area? Do any of your neighbors have an avocado tree? I’d keep an eye out around town, and if you spot one then notice how and where it’s growing. Also, ask them what variety it is. Copy whatever is working for them. About wind in particular, avocados don’t appreciate strong, dry wind, as I see in my own yard whenever the Santa Anas burn through. But you might be able to work with your situation. Anything to buffer the wind a little will help: another tree, a fence, your house. Also, lone trees are a lot more vulnerable than groups. Planting two or three avocado trees close together might be worth a try (4-7 feet apart). Hi, thanks for all this great info! I have an avocado tree, I’m in so cal…it’s had avocados on it for about a year. In the past he trees I’ve had have fallen off when they are ripe…how come these ones are still on the tree?? Any idea which variety it is? Some varieties grow on the tree for about a year and a half before they’re ready to be picked. I’m really not sure they have a pretty shiny smooth skin and are just green. No brown or black. Also, I will try to identify the variety you have if you send photos. Hi Greg- planting a lamb and a reed in San Francisco on a north/south lot. No freezing. Mostly mid 60s, but frequent temp swings. Good sun. Clay soil. Building mounds. the back of the lot is south facing and gets full sun. Some afternoon shade from a neighboring tree to west is likely. The side fence lines are AM sun/pm shade or AM shade/pm sun. My thoughts are that the advantage of AM sun is less vulnerability to freezing since cold nights effectively end at sunrise whereas AM shade can exacerbate cold damage by extending the hours of cold. The advantage of PM sun is likely higher fruit production since PM sun is stronger and San Francisco sun is generally on the weaker side. I’m slightly inclined towards more AM sun though since it’s safer and Reed and Lamb are both highly productive varieties (down south anyway). I totally enjoyed reading your well thought out, easy to understand and very informative article on avocado trees! We just planted our first Hass avocado and happened upon your advice posts. Thank heavens we did! Now we can fix our mistakes before it is too late. Our soil has a lot of clay, but you seem to suggest that rather than dig up the tree, we should do a drainage test in a hole nearby first. I do have one question. It can never hurt to do a drainage test. It’s helpful to know how fast the soil in that part of your yard drains so you can water appropriately. I’m assuming your tree is planted level — not on a mound. I’d say the best thing you could do for your tree from now on is never water it when the soil where the tree’s roots are is still very moist. Secondly, add a mulch layer of at least a couple inches. If the trunk is not shaded by low branches, especially on its south and west sides, then it’s a good idea to either shade it or paint it with white latex. I’ve always used the paint option and never had a problem with sunburned trunks on new trees. I hope your Hass does great! Did (would) you let your young avocado trees hold fruit? 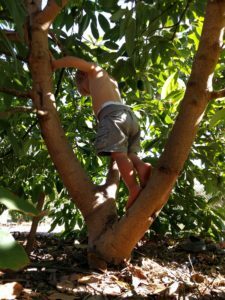 People remove fruit from young fruit trees the first couple of years to supposedly allow a stronger root system to develop, and I was wondering if you do this with your fruit trees and for avocado trees specifically? So I’d say leave one fruit, but not more than one with a five-gallon tree in its first year in the ground. With a fifteen-gallon tree, I’d still only allow two in that first year. Okay glad I asked. Come to think of it, I think it was maybe a 3.5 gallon tree, a little Cado. I planted it in the winter, and it flowered a bunch this spring. It looks like it currently has at least 10 (probably more) little avocados developing, all the size of half a sunflower seed. I imagine that most of them will fall off, but I will (reluctantly) remove them. When will it be okay to let them grow? Don’t want to stunt the growth, but on the other hand, it is a little cado, so I am not expecting a huge tree. You can probably leave them alone and all but maybe one will drop by summer. At that point, if it’s still holding more than one then remove all or leave one. It’s sad but more than half of the BB-sized fruitlets usually drop on their own. O.K., I am emotionally preparing myself for the big drop. Would it be okay to let next year’s fruit develop (for guacamole in 2020)? Almost surely, provided the tree gains in canopy size this year. Guacamole 2020! Hey Greg – I don’t know if you remember me but I planted an avocado tree in my backyard a few months ago. The tree is pretty tall and has been tied to a post this whole time. When I untie the tree from the post, it’s so tall that it curves all the way down forming almost a U shape. Should I let it fall down to the U shape and grow naturally or do I need to make sure it stays upright? I don’t want the branch to break but I have also read here that you shouldn’t leave it on its original post for too long. What are your thoughts? Yes, I remember you. I’m glad your tree made it through that crazy late February cold spell. One of my newly planted trees didn’t. Tie the tree between two stakes so it can sway just a bit. This swaying strengthens the trunk. If it’s very tall or very weak, you may need to tie it in two spots on the trunk (for a total of four ties because you’ll have one on each side at both spots). Usually the tree will be able to stand on its own after a year, but not always. I’ll write a more detailed post on staking avocados soon. It will help so much to see photos. Such a bummer, Eric. Sorry to hear this. I’ve also been told by a U.C. farm advisor for avocados that pretty much all of our soils can be assumed to have the fungus. And there’s no eliminating it. But it can be managed as long as the soil’s drainage is decent. Have you dug a hole and tested the drainage in the Sharwil’s (and Reed’s) spot? The rule of thumb is that if water is still in the hole the next day, don’t plant an avocado. On the other hand, excellent drainage is like what I have in most of my yard, where water doesn’t last even 30 minutes. Almost always though, the same yard will have spots with faster and slower drainage. I once visited an avocado orchard where there were 80-year old Fuerte trees that looked perfectly healthy, and then there were a couple of rows of new Hass trees down in a low spot — but not far away — that were sickly yellow and rotting. Assuming your drainage is fast enough, then I’d plant again but on a slight mound, up to a two-foot mound if your soil is a clay type, and irrigate very carefully, mulch up to a foot thick, and be very vigilant about gophers. Gophers damage roots, and apparently, damaged roots are attractive to the Phytophthora cinnamomi fungus. I once had a Sharwil (it so happens) that kept getting damaged by gophers and it started to show root rot symptoms in both the roots and foliage. I eventually removed the tree. There are other things that farmers do to combat root rot, like using resistant rootstocks and chemical injections, but these aren’t really accessible to us home gardeners. Please let me know what you end up doing, discovering, and how it plays out. Hi Greg, I too have issues with root rot. Some trees are dying and others are hanging in there. My question is with regard to two things that help with root rot: planting on a mound and mulching. If I continue to mulch outside the trunk, the mound eventually gets filled in and the mulch builds up above the truck/soil line and over time the mulch decomposes and the trunk ends up in a soil hole rather than on a mound. All my avocados that were above ground level initially are now below ground level after years of mulching…is this a concern? Thanks for all the great info! Glad you mentioned this observation. My older trees that were planted on mounds are no longer on mounds through just the process you described. I no longer add mulch anywhere near the trunk. It all goes at the canopy edge for such trees. I’ve seen no problems with these trees. I also have an orange tree that is decades old and the soil/mulch level near its trunk has crept up over the years until the graft union is now half buried, but the tree shows no concern and I believe it’s because it has happened so slowly and with mulch rather than soil, just as happens in nature. The only problem I could foresee with such a situation is if irrigation water is hitting the trunk, particularly if the irrigation is frequent. So I’d avoid that. This is such a great document, you are so appreciated for sharing your insight! Well done! Warmest wishes from an avocado amateur trying not to kill his first tree! Thank you, Jonathan. You can do it! We live in Twentynine Palms California at an elevation of about 1500 feet and we just planted a HASS cold climate avacado tree and hope it will survive. It seems that in Twentynine Palms your challenge will be in protecting the avocado tree from heat and cold. Since you already planted it, I won’t bother saying anything about choosing a planting site. Once winter rolls around, you’ll want to protect the tree on nights that get to or below about 30. I’ll write a post before winter about ways to protect young avocados from cold. Wow! What a great resource. Thank you for the trove of information; so helpful. I am in Lake Elsinore and this weekend planted two 15 gallon Gem avocados. Both are about 6 feet tall and one already has 8 raisin-sized avocados on it. Reading some of your other posts, is it correct that you’d recommend removing some of these before they get too big to help strengthen the tree? I realize we are strategizing for the long game here…. I bought the Gem because it seems they do well kept small, which is what I am after. I don’t plan/want to let these get much over 8-10’ tall and would like to encourage lateral growth if I can. Although I didn’t specifically set out to do a drainage test, I do recall as I was prepping the ground for digging, that a hole roughly 15” x 15’ I had filled was drained in about 3.5 hours. As you mentioned in another post, I too have never seen pools of water remaining in my yard for a considerable time even after the biggest of storms have rolled through. In digging the holes I did encounter some large rocks and clay deposits. I made sure to remove those and hope that was the right choice. I currently have a mulched area 36” in diameter around each tree. However, beyond that 36” the rest of the area is rock on top of fabric. I’m wondering if I went to small on the mulch area now that I’ve read some more? Would you suggest a wider area? I can certainly pull back rock and fabric if need be and go as wide as 5’ diameter if needed. I’m extremely uncertain about what to do long-term for watering. I’d like to have these trees on an automated system as much as possible with the hope that I can adjust the schedule seasonally as needed. I do think I can free up one of my current irrigation valves such that I can rededicated to these trees alone. Do you have any suggestions to help with that decision and if you think the DIG micro sprinklers could be used in that application? I plan to follow your advice in getting my hands dirty to check the water content in the soil as my guide to watering. Thanks in advance for any time spent in responding. Glad to hear you find the site helpful. I wouldn’t bother removing the fruitlets as you’ll find that most drop on their own soon. If any hold and weigh down the tree to one side, you might remove some of those. For a 15-gallon tree, I’d allow each to hold no more than a couple fruits in total this first year. In keeping these trees to ten feet max in the long run, you’ll just want to be careful about exposing branches to sunburn when you prune since Lake Elsinore is on the hot side (like where I am in Ramona). Immediately paint any exposed branches unless it’s winter. Your soil sounds good for avocados. A three-foot diameter area should be enough through this summer, but I’d remove fabric and rock to widen it by the late fall in anticipation of winter rains. The trees will be happy if they can extend their root system there under mulch rather than fabric and rock. Then be vigilant when our first heat wave hits. It’s possible that the trees could need water every day for that spell. Through the summer you can likely water every 4-7 days, but get your hands dirty to feel the moisture often if possible. 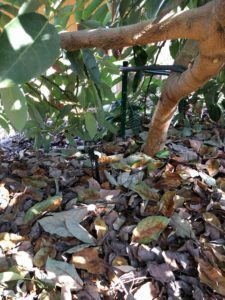 There are many good irrigation options, but the DIG micro-sprinklers are very convenient since you can use them from now into the mature years of the trees. Start with the 90- or 180- degree insert. That should work well for the first few years. Having a dedicated valve will make your watering job much easier. But it’s not necessary. I irrigate some of my avocados on the same valve as some citrus trees, which isn’t quite as efficient as it could be (the citrus trees sometimes get more water than they need). But it works. I have a post specifically about watering avocado trees in the works. I’ll make sure to get it published within the next month, before summer. Best of luck! Thanks you Greg, this was super helpful. Just last sunday my tree was full of healthy looking leaves and lots of fruit. I watered it and sprinkled some commercial fertilizer. With the heatwave we had the past few days i didn’t go out to check until today, and it looked horrible. All the fruits have dried out and the leaves are all dry. Any idea what could have caused such a think in just 1 week? Your avocado tree is not alone. My trees also got burned to greater and lesser degrees by that record-setting heatwave we just went through in Southern California. The bottom line is that avocado trees are not suited to that kind of intense heat, which is why they’re not grown in the desert. Luckily, our trees might recover now that the temperatures are almost down to normal again. Also, see the video at the end of that post where I show some of my sunburned trees. And this week’s post (on Friday) will be all about that heatwave and its damage and how we can best get our plants through such an event in the future, as well as how to manage their recovery. Can you plant and avocado tree where an existing tree one stood? In general, yes you can. Was it an avocado or a different type of tree? Did it die or was it removed while healthy? Was it a big tree that had its stump ground down? Hi Greg. I am relandscaping and would live to add an avocado tree. How far from a block wall should it be? Thanks! It depends how tall the block wall is, among other concerns, but I know of excellent, old avocado trees growing only about five feet from short block walls (five feet tall or less). As long as the tree has space to spread out its canopy away from the wall or it can grow up and over the block wall, then it should do fine. We have a tree that we inherited when we bought our house a few months ago and we no nothing about it’s history including the type of avocado it is or it’s age. We’re also struggling with a lace bug infestation causing premature leaf drop and dead branches. On top of all of that, the base of the tree is in a about a 12-24 inch radius of soil which is then surrounded by concrete. I noticed you said in your post that it’s still possible for avocado trees to grow with concrete around them which is wonderful to hear! But how do I compensate for the lack of soil space it has? Is there anything special or different I should be doing in terms of watering, fertilizing, etc? What a challenge! I’ve seen avocado trees doing well with concrete or asphalt under much of their canopy (see a photo of one in this post: http://gregalder.com/yardposts/how-much-and-how-often-to-water-avocado-trees-in-california/), but I can’t recall having seen one doing well with only a foot or two space for their trunk like yours. In fact, I recently visited an old avocado tree that had been doing fine a couple years ago. Recently, the owners covered all soil under the canopy with large river rocks and concrete. The tree is now half dead. In your case, I would do my best to figure out where the tree is getting its water in the summer. For example, is there an irrigated lawn nearby that its roots might be reaching into, or a flower bed, etc.? If the tree looks healthy, then don’t mess with whatever other plants are growing and being watered near it. Keep up the same routine as you inherited, especially until a couple inches of rain fall this winter. At that point, you could safely fiddle with things if you want. But in general, if the tree is more than about five years old (trunk diameter as wide or wider than your shoe? ), it has probably gotten used to its conditions and is getting its water sufficiently during summer, and don’t do anything different until it tells you it’s under stress. Also, don’t bother fertilizing until it tells you it needs fertilization. Let me know if it ever seems stressed and we can try to determine why and how to help it at that point. I want to grow citrus and avocado tree’s but I live in Carmel California, the Zone is 17. Is it still possible to grow avocados when you say 18 as the minimum climate zone? I’m almost certain that you can grow some kinds of citrus and avocado trees in your yard in Carmel. 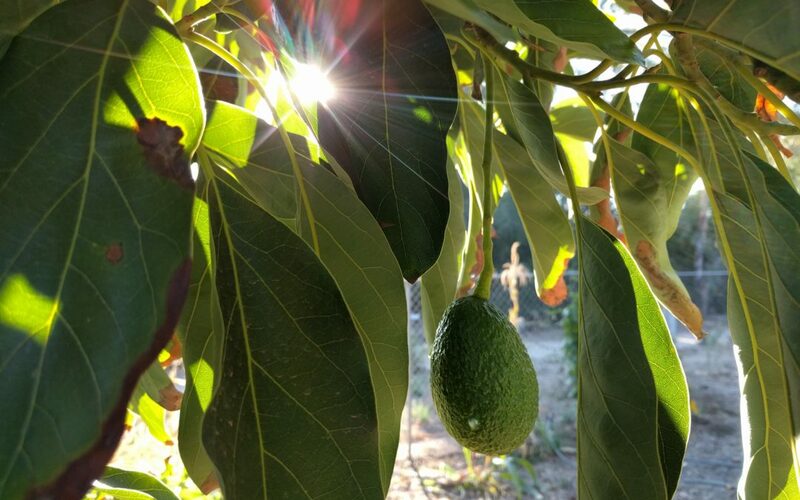 The lower limit on avocados in general is not Sunset zone 18; it’s just that for Southern California, from zone 18 on up we can grow almost any kind of avocado we want. 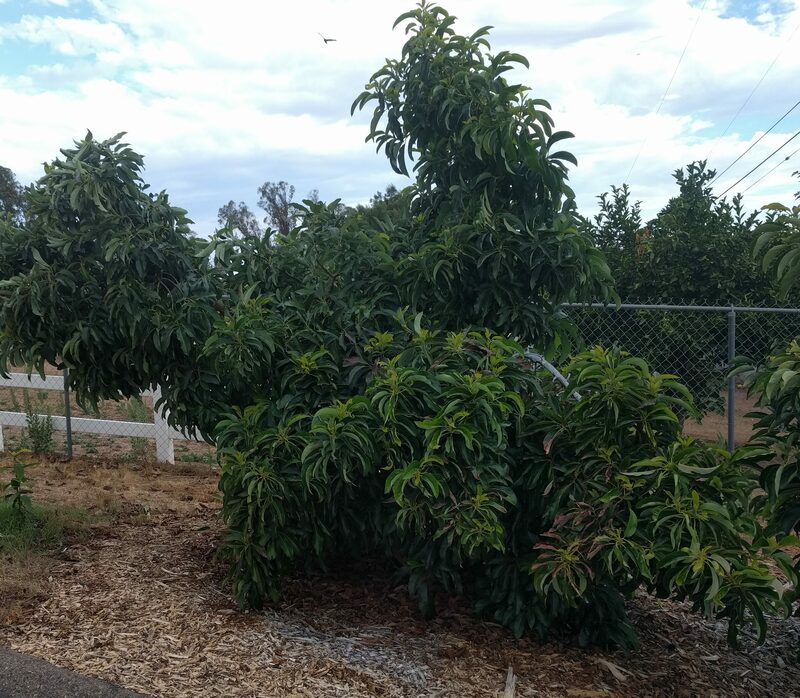 I’ve seen beautiful, large, productive avocado trees in places that get chillier in winter such as Coalinga and San Jose. But these were not Hass trees, which are on the cold-tender side. The one in San Jose for example was a Fuerte, which handles cold a little better than Hass. A lot might depend on the lay of your land and its particular microclimate. Most likely, the determining factor will be winter cold. So if you are on a slope from which cold air drains away, then you’re odds are better. 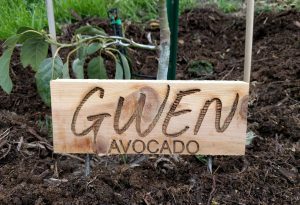 I’ve read about a couple of commercial groves of Hass and Gwen avocados not too far from you near Gonzales and Soledad. So I’d say it’s really worth a try. You should just plant a couple trees in the spring so they get as big as possible before their first winter, then plan to protect them if there’s a freeze during their first and second winters. By the time they’re three or four years old, they’re a lot tougher and resilient when they do get nipped by winter cold. I have a really small yard. 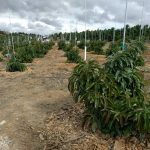 Can avocado trees be planted in containers and produce? If so what size planter do you recommend and is any special feeding required in pots? It is possible to get avocado trees to produce in containers. I’ve seen it done. I’ve done it myself once, but not long term. I’ve never seen it done long term. If I had to grow one in a container, I’d try to move up in container sizes every couple years until maybe a half-wine barrel size ultimately. And I’d be sure that my potting mix was extremely low in salts; avocados do not like salts, especially chloride. That is the special feeding required. If you have a really small yard, and you have a dirt patch to plant in, you could put the tree in the ground and keep it pruned small. Some varieties are particularly amenable to this. You can grow a great avocado tree in the ground and keep it pruned to eight feet tall and even less than eight feet wide. Do this with a Reed or Lamb variety, and you can still easily get 30 or more avocados each year on the tree. I’m not speaking hypothetically here. I do this with some of my avocado trees (keep them pruned small), and I’ve seen others do it in small yards, and commercial farmers even do it a lot now because it is so easy to maintain and harvest from small trees. I discovered your web a few days ago and it has answered all my questions but one. In the summer it is daily between 80 to 104 and here I have to protect my trees against the heat with shade 80% net. The soil is clay but his I break up add rice husks,cow or chicken dung, coconut husks. I dig holes three feet deep and the also plant the trees about 18 inches higher than the surrounding land and have had no problem with root rot so far. My question is I have been informed by Dr Ernst of Allesbeste nursery an South Africa that the trees will have difficulty flowering and then being pollinated due to the heat. Greg: I have a 25yr old Fuerte in No. San Diego county/coastal. Last year it produced 110 fruit, this year 20 most likely from poor pollination. Since January 2019 I see a lot of leaf burn, mostly tip and some a little further up. I think its from our cold Dec/Jan but am concerned. Also Dec-Feb we’ve seen a lot of rainfall so I don’t suspect excess salts. Now Feb 10 I do see the tree is full of many clusters of buds which I’m not sure if theyt’ll become new leaves or is it the start of fruit production. Any comments on the burn would be appreciated. Is it too late to fertilize with buds on the tree. Thank you very much. The bummer is that the leaf burn we see on our trees right now comes from the excess salts and irrigation practices of months ago. The salts accumulate in the tree over the summer and even if we get good rains like we are this year, the leaching effect of the rain won’t be seen in the foliage and performance of the tree until later this year (or even next year). In other words, you probably don’t need to worry about the tree. Last year was exceptionally harsh since we had a very hot summer that followed on the heels of a winter with very little rain. Expect to see an improvement in the foliage only later in the spring when it grows new leaves. My Fuerte is also starting to push out flower buds right now although none have opened yet. I’ve seen Fuertes in warmer spots with flowers already open here in early February. Fertilizer timing depends a lot on which kind you’re using. Chemical fertilizers are vulnerable to being leached through the soil profile here in winter with our rains. Organic fertilizers are much less vulnerable to that. 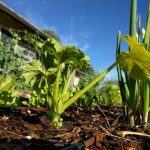 Now is a great time to apply composts or other mulches since the rains will leach some salts but most of the nutrients will remain. Gregg: Thank you so much for your prompt and valuable reply. Very much appreciared. I’ll continue to follow your blog/posts/articles. Thank you again. Ps; I registered and hope I’m on your mailing list? Hi Greg, going through your old post right now. Very informative Q&A. Since my soil is thick and clayish, I may have to plant the avocado tree on a mound. What kind of soil would be good for the mound? In my yard, I don’t want to take soil anywhere in my yard to build the mound. And how would you deal with the interface between the ground and the new soil for the mound? Should I soften up the native soil on the ground for the bit and then put new soil on top of it? With these heavy rains, do you have any ponding in your yard? Have you dug a hole and tested the time it takes water to drain out? It’s good to know what kind of drainage time you’re dealing with before you go forward with planting the avocado tree so you can do your best by it. A sandy loam soil would be ideal to use to make your mound. I would mix the new topsoil with your native soil a bit at the interface so there’s not a sharp change in soil type. Mix an interface of approximately six inches to a foot, and then build the mound of new soil above that. thanks Greg. Can I send you an email with a few pictures of my yard. I took several pictures of the spot in my yard I want to plant and want your take on it. Love this site and appreciate your local expertise! We have 3 beautiful young trees. A Hass has 2 stout suckers. I know I need to cut them off. At the soil-line? Dig down a bit and remove where they start? Thanks a lot Greg! Thanks! Either way can work. If you cut at the soil line, they’ll probably sprout again, but you can just snap those new sprouts off by hand. After doing this a couple times, they’ll likely stop sprouting. If you dig down a little to cut lower, they’ll probably resprout less. Thanks, Greg! I’ll take care of that tomorrow. I also read your corn article. Hubby wants some corn so I’ll be planting some seedlings, also. Thanks for all the great (and fast) advice. We are not sure if we under watered or over watered it? Or water is not the cause?? I have pictures which I can email you if you are okay to share your email address! It’s likely that the old leaves are just dying a natural death and will soon be replaced by new ones. This is the time of year for that.